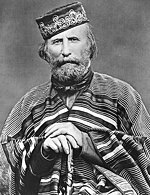 Giuseppe Garibaldi was an Italian soldier. He led the navy of the Riograndense Republic in southern Brazil until it was defeated. He led the navy of Uruguay to victory. Later he fought for Italian unification. He led a group called the Red Shirts through the Kingdom of Two Sicilies to bring together the kingdoms of Italy in 1860. This page was last changed on 28 April 2018, at 00:14.